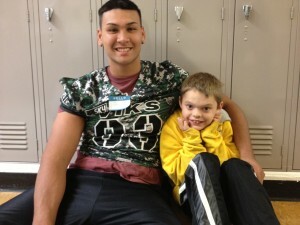 PSU Football students visit students at Marysville! In October, we had 23 football players from Portland State University visit students in The Shadow Project at Marysville School. Many of the players have ADHD or dyslexia and spoke to the students about their own struggles in school and how they learned to persevere. The visit was an inspiration to everyone. Thanks for the encouraging words, Jayden!